Cookie Craft authors Valerie Peterson and Janice Fryer dress up the classic heart-shaped cookie with some Valentine’s Day love. It’s already Valentine’s Day and Santa still hasn’t brought either of us what (who?) we asked for this past Christmas. And Colin Firth appears to still be married. . . . 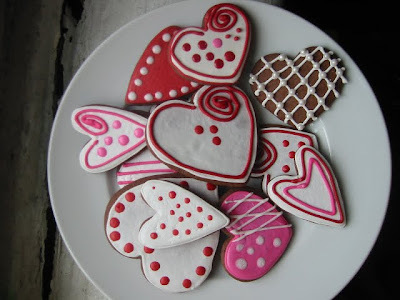 Therefore, we once again must bestow our Valentines — in the form of cookies — on family and friends, for which they are ever so grateful. 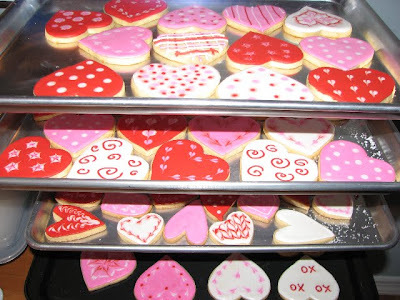 Actually, Valentine’s Day cookies are among our favorites to make, no matter who gets them. With three colors (red, pink, and white), the setup to create a wide variety of designs is relatively quick. We typically use our chocolate cookie recipe for a nod to V-Day tradition, and it’s always a hit with chocolate lovers. So if you’re in the mood to join the fun, we’re posting directions to decorate two of our favorite Cookie Craft hearts. To make these you’ll need chocolate cookie dough (recipe provided below), a large heart cutter (3 to 4 inches high is good), and a smaller, fluted heart cutter (approximately 1 inch high). To make both these designs, you’ll need piping and flood icings in pink and red (recipe provided). Set up two pastry bags, one for each color of piping icing and two squeeze bottles, one for each flood color (if you leave some of each icing — piping and flood — in white, you’ll have another color to play with; just set up an additional bag and bottle). Cut out as many large hearts as possible from the recipe. Cut out a smaller heart from the center of half the large hearts. This will give you equal numbers of solid hearts, cut-out hearts, and small hearts. Bake all the cookies, small and large, according to the recipe instructions. Pipe and flood a pink heart shape about 3/8 of an inch inside the edge of the cookie. Allow to dry. Pipe dots around edge of pink heart. 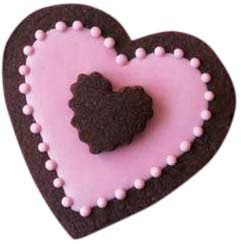 Using piping icing, affix smaller heart cookie to the center of the pink heart. Allow to dry completely. Pipe and flood entire cookie in red. Allow to dry. Pipe dots in design as shown; allow to dry completely. Of course, you can let your imagination go further with your two or three colors (and your other Cookie Craft techniques!). Sugar heart sprinkles and other holiday embellishments can make the decorating even more fun. 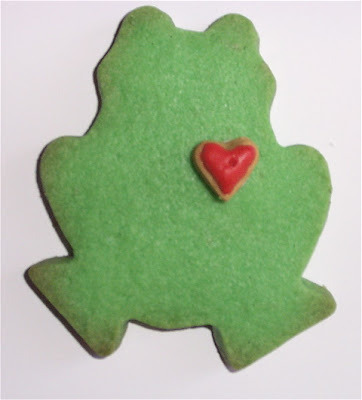 And for those, like us, who have a few more frogs to kiss, we love our simple frog cookies: make with colored sugar cookie dough and a simple red heart! The deep, rich color of this dough makes for great spooky Halloween shapes. 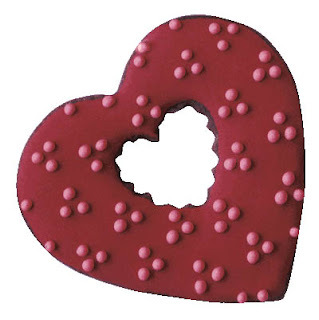 They’re also great for Valentine’s Day hearts — in fact, some people believe chocolate to be an aphrodisiac — or any time you desire a chocolate-flavored cookie or a darker background for your decorative genius. Whisk together the flour, cocoa powder, espresso powder, and salt in a medium bowl and set aside. Using your mixer, cream together the butter and sugar until the mixture is light and fluffy. (If your mixer has multiple attachments, use the paddle.) Add the egg and vanilla, and mix until well blended. With the mixer on low, gradually add the flour mixture to the butter mixture until the two are thoroughly blended. Turn out the dough onto the work surface, and divide it into two or three equal portions. Form each one into a rough disk. Now you’re ready to roll, chill, and cut out the cookie shapes. After you’ve rolled and cut the dough and the cookie shapes are on parchment-lined cookie sheets, bake in the middle rack of your oven for 12–16 minutes or until the cookies start to turn a deeper brown around the edges (smaller cookies will be done more quickly). Note: If you decide to bake two sheets of cookies at a time, space your two oven racks evenly in the oven and rotate the cookie sheets halfway through baking (that is, switch the position of the top sheet and bottom sheet and turn both so that the front of each sheet is at the back to promote even baking). Cool the cookies completely on a rack before icing or decorating. Combine all ingredients in the bowl of your electric mixer. When you reach the desired consistency, it’s important that you immediately cover the mixture or store it in airtight containers. Use the water amounts in our icing recipes as starting points, but be prepared to adjust them depending on the weather or even your kitchen temperature (for instance, when Valerie runs the dishwasher in her tiny Manhattan kitchen, the whole room gets very hot and humid). Be aware that the amount of water you add to icing may change slightly every time you make it. Janice likes her outline icing on the thin side (so it blends seamlessly into the flood), but Valerie likes the control that comes with an outline of slightly thicker icing. The great news is that Royal Icing is very forgiving. There are more hints in Cookie Craft — and know that the more you work with Royal Icing, the more you’ll figure out what your preference is and how to achieve it. Look for the paperback edition of Cookie Craft on shelves this spring! Valerie Peterson is a writer with over 15 years' experience working with cookbooks. She grew up in Yonkers, New York, where her second-favorite toy was her Easy-Bake Oven. She now lives in Manhattan. Janice Fryer is a pastry arts graduate of the Institute of Culinary Education in New York City. A California native and a New Yorker at heart, she lives in Brooklyn with a crazy dog. Keeping her from eating her creations is always a lively challenge. Valerie and Janice are the authors of Cookie Craft and Cookie Craft Christmas.